Find Truck Service® Authorized vendors offer exclusive discounts and rebates as well as everyday 6 MONTHS Special Financing* on all repairs, services, parts and tire purchases of $199 or more on the Find Truck Service® credit card! AM PM Tire Services & Road Service is an Authorized Find Truck Service® vendor. Find Truck Service® has helped owner-operators manage millions of breakdowns and nationwide repairs since 2007. 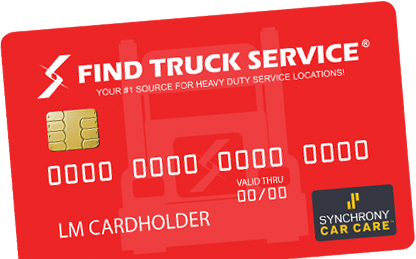 Today, we help our industry owner operators better manage those expenses by paying for them over time* with the Find Truck Service® credit card. NO INTEREST if Paid in Full within 6 Months** on purchases of $199 or more made with your Find Truck Service credit card. Interest will be charged to your account from the purchase date if the promotional purchase is not paid in full within 6 months. Minimum monthly payments required. This is an everyday offer for cardholders with all qualified purchases. Use your Find Truck Service credit card to pay for services, repairs, accessories and parts at more than 500,000 truck and auto parts/service locations nationwide. The Find Truck Service cardholder special financing benefit is available for all your service needs, roadside service, in-shop repairs, towing, parts and much more at more than 500,000 locations nationwide. As an owner-operator you need a dedicated line of credit that meets your heavy duty service, parts and maintenance cost demands. With the Find Truck Service® credit card you can get a fast credit decision up-to $10,000 at our Authorized vendor locations and up-to $5,000 online. You can also call 866-396-8254 to request a credit limit increase on your online credit approval. As a Find Truck Service cardholder you'll enjoy exclusive discounts and rebates throughout the year to help you save money on repairs, routine maintenance, services and parts. Find Truck Service Cardholder discounts and rebates can be used on every day repairs, services and parts purchases at all Find Truck Service Authorized vendor locations nationwide. At Find Truck Service Authorized vendor locations you can apply and finance all your repairs, services and parts right away, you'll also receive any available discounts/rebates, this is only at our Authorized vendor locations. Please take a minute to let your favorite service locations know that they can provide financing and exclusive discounts/rebates to customers with Find Truck Service, setup is easy and NO COST to them. We are aware that owner-operators spend a lot of time away from home and on the road which can be very inconvenient to manage accounts and payments. The Find Truck Service credit card account management is convenient and can be fully managed online from anywhere and to avoid any potential late payments you can also setup automatic monthly payments online. Helping Owner-Operators Stay On The Road! Find Truck Service® started in 2007 and over the past decade our service locators have helped owner-operators and trucking companies manage millions of breakdowns and nationwide repairs. 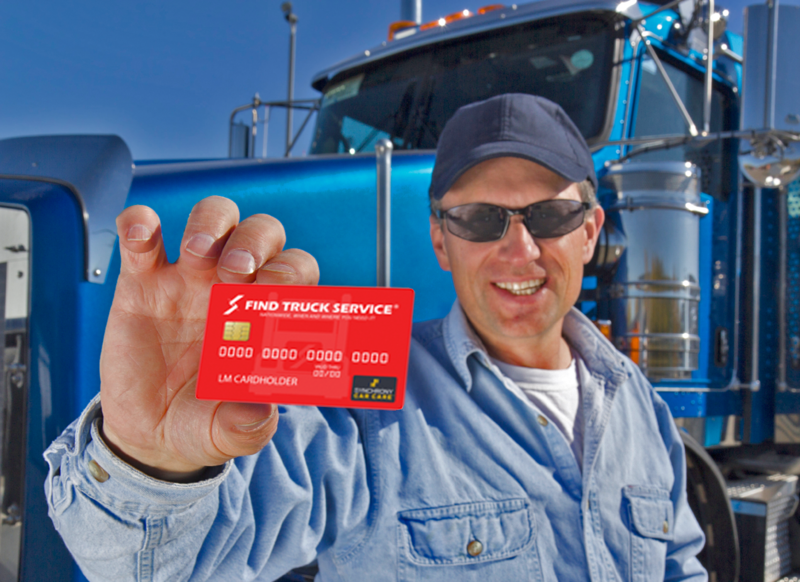 Today, we offer our industry owner-operators the Find Truck Service® credit card to help you better manage all service and parts expenses by paying for them over time*. Find Truck Service® loads more than 100,000 business listings for owner-operators and trucking companies in our search results, every day! I used to call my company when I needed service on the road and they would provide me with a number to call, most of the time they were pretty far from me but I had no choice but to call them. After using your website I realized I can do it myself and find closer services and save some money. I never knew there were so many service providers available. This is one of the greatest apps I have ever had the privilege of using. I was looking at the reviews and I agree with the praise of this app. This app is an asset for all professional drivers and owner-operators. 5 REASONS TO APPLY NOW! What is the Find Truck Service Credit Card? How do I apply for a Find Truck Service Credit Card? You can apply for a Find Truck Service credit card online by clicking here and get a fast online credit decision or you can visit any of our Authorized vendor locations nationwide to apply in person. • Pay Online: Click here to manage your account and make payments online. • Pay by Phone: Contact Synchrony Bank Customer Service 866-396-8254 during the hours listed below to make a payment by phone. • Pay by Mail: Mail payments to the address below. Ensure that you have plenty of time for your payment to arrive prior to the due date. ** Offer applies only to single-receipt qualifying purchases. No interest will be charged on the promo purchase if you pay it off, in full, within the promo period. If you do not, interest will be charged on the promo purchase from the purchase date. The required minimum monthly payments may or may not pay off the promo purchase by the end of the promo period. Regular account terms apply to non-promo purchases and, after promo period ends, to the remaining promo balance. For new accounts: Purchase APR is 29.99%. Minimum interest charge is $2. Existing cardholders: See your credit card agreement terms. Subject to credit approval.